In New York City, Thor and Valkyrie tell Nova the story of a past warrior. This man fought battles with Thor and Valkyrie long before the British, Roman, Egyptian and Mongolian Empires were formed. In fact, they took place on Asgard long before any cities existed on Earth! This warrior was named Glane. He was given a mission to gain intelligence on troll army positions to a group of stranded Asgardian warriors. Amongst those 100 Asgardians outnumbered by 70,000 trolls were Thor and Valkyrie. Glane fought valiantly on his mission and killed a large number of trolls in numerous battles. However, he eventually fell to overwhelming numbers. Without succeeding in his goal, the stranded Asgardians fell with the exception of Thor and Valkyrie. Asgard's leader Odin condemned Glane for thousands of years to the Field of the Fallen and forbidden to enter the Asgardian heaven of Valhalla. Nova and Thor disagree that Odin was right in punishing Glane. Richard Rider believes it was too harsh and the warrior had fought bravely. The thunder god feels his father was simply doing what their society demanded of him. Rich sarcastically mentions that he'll keep that in mind the next time Thor asks him to pass the ketchup or take his cape to the cleaners. The two Asgardians also mention that Glane was given tasks to accomplish during his exile including the Pit of the Red Viper, the Charge of One Thousand Trolls along with the Test of Lightning. Every decade, Thor and Valkyrie deliver Odin's new assignment to Glane. These tasks have been done for hundreds of decades and have always been completed by the exiled warrior. Nova discovers that Valkyrie has requested that he come along with them on their trip to visit Glane. Before the three heroes enter the dimensional portal, Thor tells Nova he is glad he is coming with them. Rich is surprised and proud his friend feels that way. The god of thunder then tells him he believes Valkyrie is a troubling companion and that Nova is very good with the ladies. Since women completely leave him alone, they never bother Nova at all. Rich is crest-fallen by his teammate's joke. Seconds later, the portal deposits the three heroes into the Asgardian Underworld. Rich wonders why Odin didn't simply open the portal at Glane's exact location. Thor explains that their journey is just as much as trial for Valkyrie and himself as it is for the one they are seeking. The thunder god's father wants them to prove their worth in battle or they will be required to stay in the Asgardian Underworld forever. Nova is less than thrilled at the idea. Minutes later, the three heroes land in a barren field and are approached by a number of goats. As Rich walks up to one of the goats, he finds himself knocked to the ground by the super-strong animal! The goats attack the superhumans until Thor picks up a giant boulder and smashes them! He then unleashes giant bolts of lightning to finish the rest! Thirty minutes later and further into the Asgardian Rifts, Nova is attacked by a a caveman-like being! As Rich blasts his attacker in the face, Thor explains to him that the Neo-Men have been in this valley even before the Asgardians began recording history. More Neo-Men join in the ambush but are quickly defeated by the three. Realizing all the types of threats in the underworld, Richard Rider finally confronts Thor and tells him that Glane has been been treated cruelly. He also believes it is Odin who has failed the warrior with his punishment. The two Avengers strongly disagree with each other but continue on their mission. Minutes later in the Soulless Ice Fields, the heroes are attacked by blue hairy giants. As they fight the beasts, Nova and Thor continue discussing the merits of Odin's punishment. The god of thunder explains that his father's ways have allowed Asgard to survive against many powerful threats. To prove his point, Thor unleashes an extremely powerful lighting barrage to stop all of the attacking beasts. Thirty minutes later in an area called The Old Trees, Valkyrie talks to Nova about why she brought him along. She explains that he was needed in order to make Thor angry. In fact, Valkyrie believes she has never seen him so furious due to their argument about Glane. The female warrior further informs the young Avenger that the only way they can survive their mission is for Thor to be angry. Otherwise the evils in the forest will destroy them all. Rich understands soon afterwards as his fellow Avenger levels the Old Trees in a blast of pure power! Another thirty minutes pass and the heroes find themselves in the Cave of the Abyss. Valkyrie reveals to Nova that Glane has spent the last decade securing the cave from an onslaught of rock trolls. 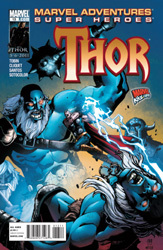 Further in the cave, the three warriors come upon Glane and Thor delivers Odin's message. Back in New York City, Nova and Valkyrie return through the portal. Rich admits to not understanding the Asgardian way. Glane had decided to stay and continue the battle he has been fighting for centuries. Valkyrie explains that it's not the same as it was before. Glane no longer has to battle alone since Thor is now fighting by his side.